Too much of a good thing is wonderful, right? Then, I saw the latest project from Craft Hope: Liberian orphan education project. More beanbags? I couldn't be more thrilled to participate. If you'd like to make a set or two to donate, here's a quick run-through on how I create my beanbags. Cut fabric into 6 x 6 inch squares. Pin, right sides together, and sew, leaving a 2-3 inch hole for turning. Snip corners, being careful not to cut into any stitching. Admire the super cute scraps. Turn rightside out. Poke out corners with a knitting needle and press. Topstitch your beanbag, making sure to sew the opening shut. As you're sewing, shift the bulk of the beans to make it easier to stitch. Trim your excess threads, and you're done! And if you want a set of your own without having to sew, you can get one in the shop. So cute! Might have to attempt these! These sets are just too cute... Must make some for my grandbabies soon.... before they grow up! Just adorable...I might do some of these with sight words to play games with my son who's having trouble with them. Very cute! And will be so fun to play with! Hey, love your blog. I have an idea for your corner scraps from all your bean bags. So cute! What a great tutorial girl. Hope you have a wonderful Easter weekend. Thank you for such insipiration and for taking part in the project for Liberian kids. Your contribution will make a great impact on those children and their teachers. Your bean bags will be a bright spot in those little, bare classrooms! 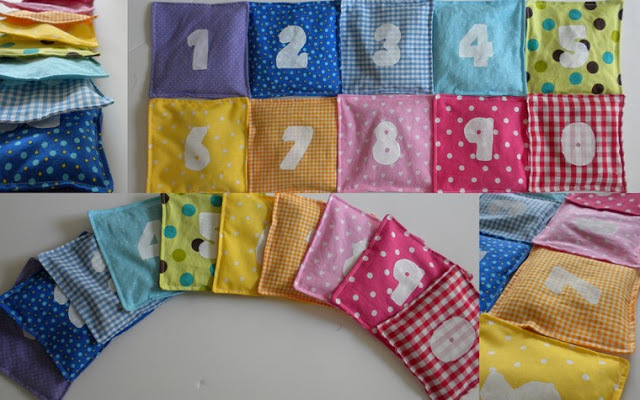 YOU COULD TOTALLY DO THESE WITH THOSE SUPER CUTE SCRAPS!